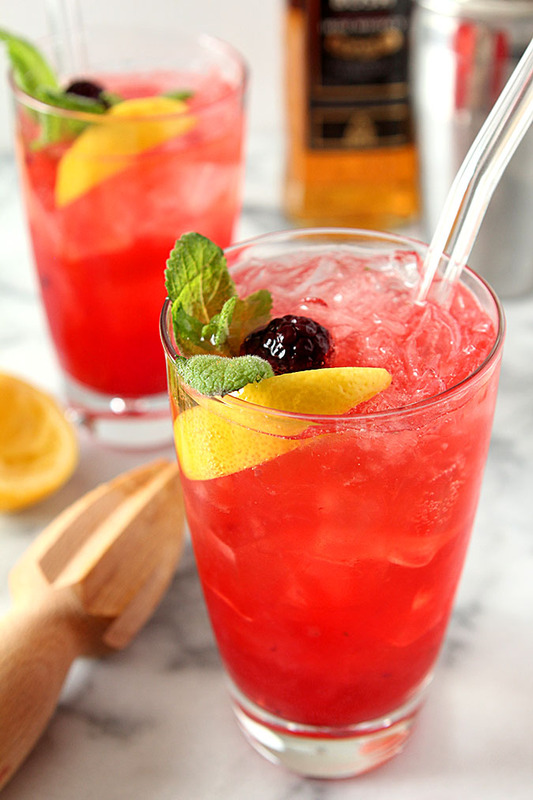 A light and refreshing summer beverage, this Blackberry Whiskey Lemonade is gorgeous too! Perfect for picnics or an evening around the grill; it’s one of our favorite summer libations. Can I be honest? This has been a long and miserable week; actually a long and miserable month. I’ve had some serious site issues affecting the viewers that try to come and read this blog and it’s starting to take on some James Bond theatrics that have been stressful…and for me stressful means laying awake at night, unable to sleep. So far the only concrete thing that is pointing to a problem is a site in Iran that has apparently set up a proxy and my traffic is being relayed to that address. From what I understand, this isn’t necessarily malicious but one way that people in countries with government restrictions escape the boundaries of those restrictions and are able to view information from the ‘outside’ world. I can imagine those folks do need a cocktail right? I guess this is my humanitarian effort; yes, that makes me feel much better! All this being said, I’m tired. 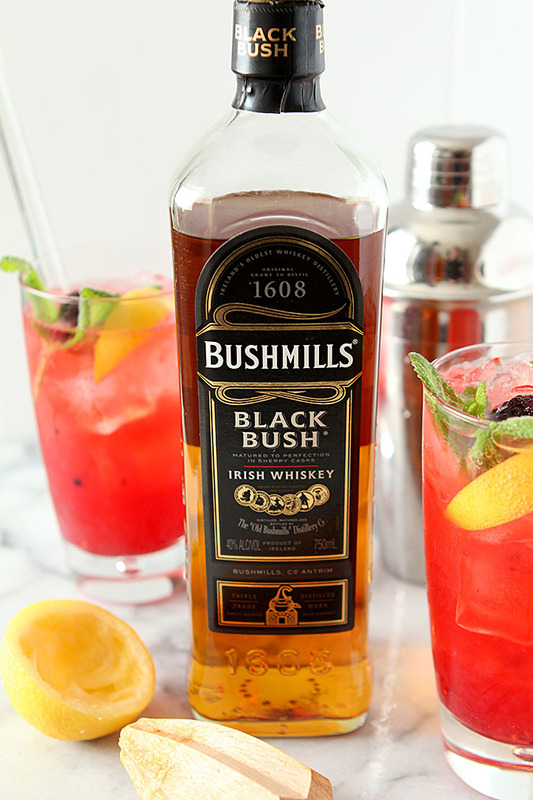 I’ve got no story for this drink except to say that I was inspired to use Bushmills Irish Whiskey and had both blackberries and lemons in the fridge and a hankering for something light and bright and reminiscent of the best of summer. Spring at the base of the Colorado Rockies means seventy degrees one day and a blizzard the next. Those warm days are such a tease…we know better is coming but then we’re hit with a reminder that the mountains can change EVERYTHING. So I hope you’ll excuse me while I exit stage left and actually go sip one of these now. Have a great weekend…Cheers! Add the Irish Whiskey and lemon juice to the shaker and fill it with ice. Shake well to combine all ingredients and strain over two tall ice filled glasses. 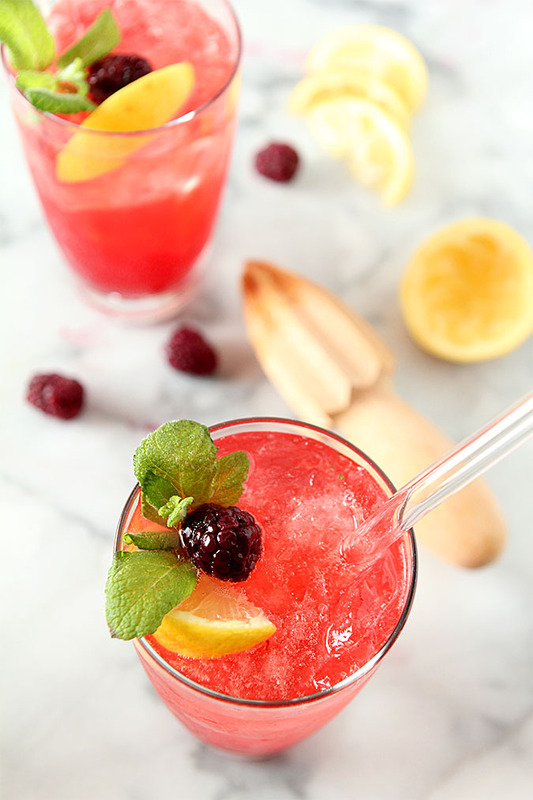 Top off with sparkling water and garnish with mint, blackberry and lemon slice. Real bummer about the problems you’re having. Hope you get them solved, and soon. In the meantime, more cocktails may be necessary. 🙂 This is a goodie — whiskey and lemon are wonderful together. Really good stuff — thanks.